Another way to do this is to make Snickerdoodle cookie dough and dip them in colored deco sprinkles rather than cinnamon-sugar or colored sugar (just makes one less step, not having to color the sugar). That's been our go-to Christmas cookie for ages! I just made these and mine stuck to the cookie sheet. I had to pry them off of it, also I put the candy cake kisses in the middle and they all melted everywhere. what could I do different? Use parchment paper and let them cool a tad before placing the kiss in the middle. I will be including these in our holiday cookie tins. 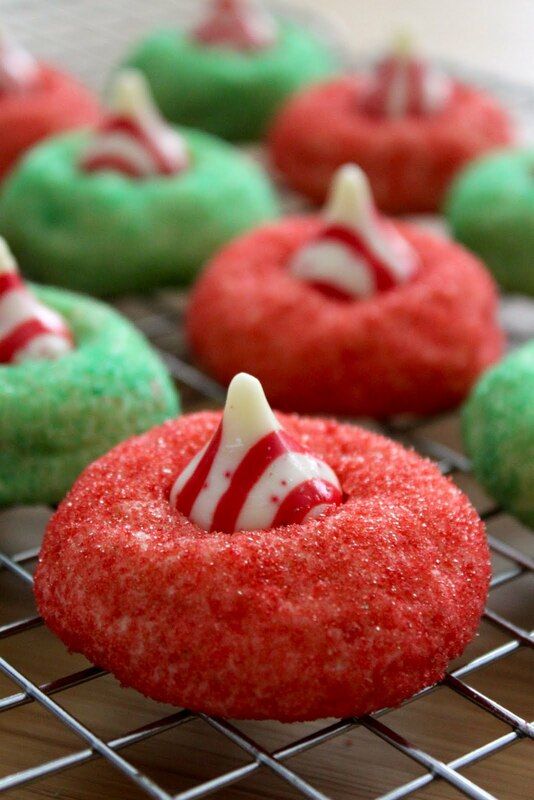 Im making these but using.food.coloring in the dough so they dont have to be completely covered in sugar. Is it o.k. to butter the cookie sheet since one person mentioned that her cookies stuck? I would put them on parchment paper. The butter may burn on your pan or burn the bottom of the cookies. I also ran into difficulties with the melting candies. I did not bake them with the candies in them. I even tried moving the cookies to a coming rack for a few moments first... Still a gooey mess.. Help!!! I usually freeze the kisses. Try that! Parchment paper works perfect to keep cookies from sticking. 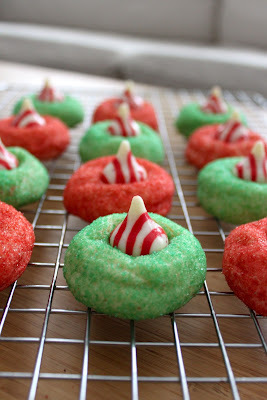 I added some melted peppermint kisses to the batter before rolling them and baking them, then added 1 kiss after putting them on the cooling rack. They were delicious! Did you soften your butter in the microwave or let it sit out to soften? I always find that microwaving butter makes ANY cookies flat. If not I don't know what to tell you.. sorry! Just made them and they were delicious! I did chilled the dough and and the Hershey's. I also used food coloring in red and green. Super cute! My dough was really sticky too. I put it in the freezer and that helped with rolling it out, but my cookies turned out flat even though I chilled my dough for 30 minutes, rolled them, and then put them in the freezer on the tray for 20 minutes before baking. They look okay, but nothing like the picture. I'm not sure how mine turned out so badly. I won't make these again. I made these last year and followed the directions exactly. They turned out great! Only thing was that some of the Kisses did melt down a bit, but they still looked cute. This year, I will take your advice and let them cool off a little before adding the Kisses. I made these cookies today and they came out perfectly, not flat at all. I didn't use butter but margarine instead. This may be the trick! They are super cute but you might as well just eat the mint kisses alone as all you can taste is the mint kiss. I had wondered before making them if that would be the case. 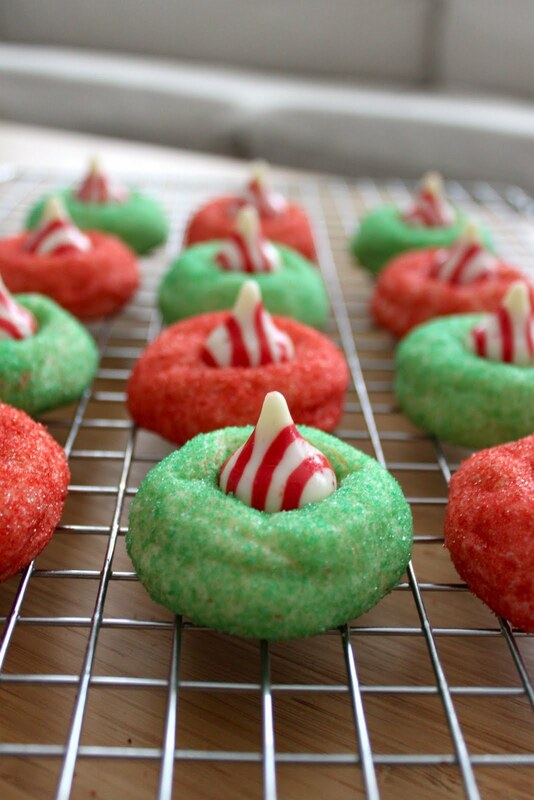 Definitely like rolling the cookies in the sprinkles though, very festive.